I have recently become obsessed with Game Of Thrones so I decided to draw one of my favourite characters, Daenerys Targaryon. As always please let me know what you think and who I should drawing next. 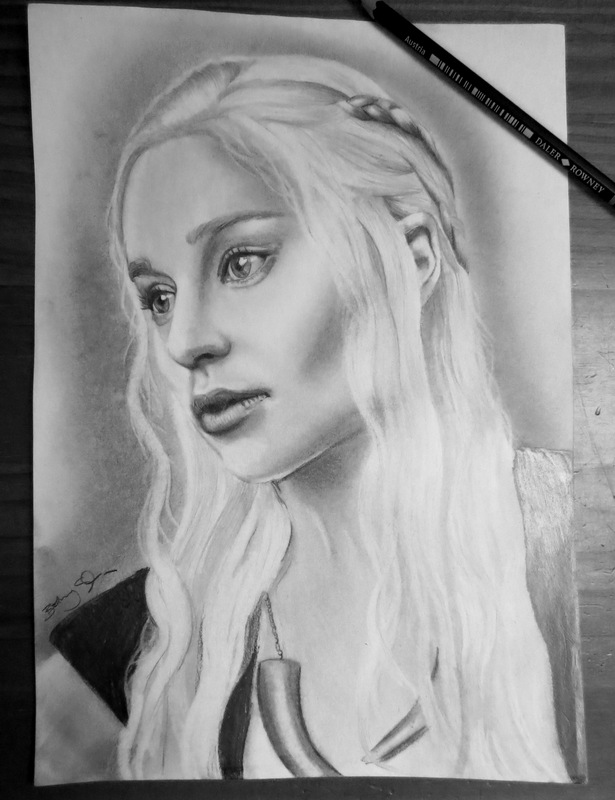 Posted in Art and tagged art, daenerys, daenerys targaryon, drawing, game of thrones, Portrait. Bookmark the permalink. So I get a lot of requests to do tutorials for drawing and I have always been quite apprehensive. However last night I filmed a video demonstrating how to draw Mickey Mouse. It was the first tutorial I have ever done so I’m not great at it but if you do enjoy it and find it helpful please let me know because I would love to do more in the future. Also, if you have any requests as to who I should do a tutorial on next please do let me know. Posted in Art, Disney and tagged art, Disney, drawing, how to, Mickey Mouse, tutorial. Bookmark the permalink. Wanted to share with you another sneak peak at my Disney mural so I have made a video showing some clips of the characters I have painted so far. Please check it out and share the video, it would mean the world to me. And as always please let me know what you think of it so far! Posted in Art, Disney and tagged art, Disney, mural, painting. Bookmark the permalink. very long time now and that is a DISNEY MURAL!! 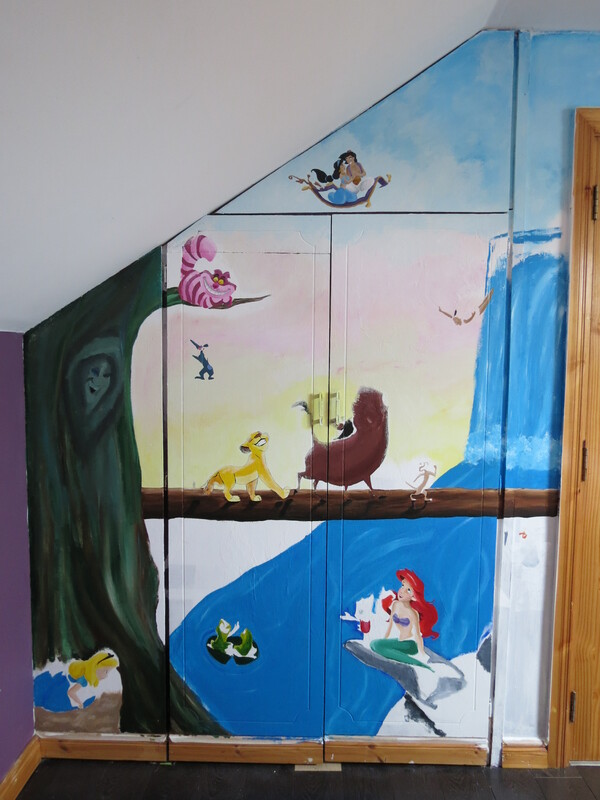 As you may or may not know I am a huge Disney fan (as in animated classics) so I thought I would put together two of my favourite things; Disney and art, and create a mural in my bedroom. While I am very far off actually being finished I thought I would show you a sneak peek of the progress so far. So this is half the mural. PLEASE note that it is nowhere near finished so it will get much better, but do let me know what you think of it so far and let me know if there are any characters I HAVE to include! Posted in Art, Disney and tagged aladdin, alice in wonderland, art, Disney, mural, painting, pocahontas, the lion king, the little mermaid. Bookmark the permalink. 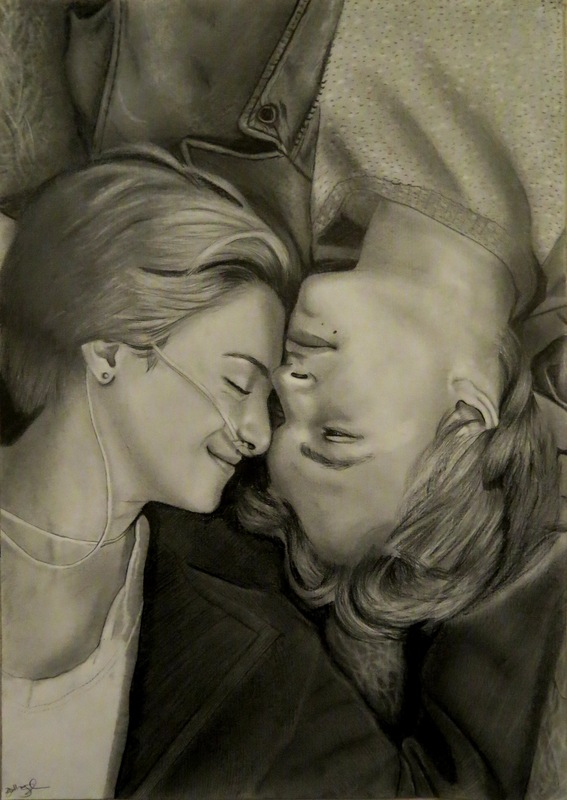 It’s no longer news at this stage that I am a huge fan of John Green and in turn his wonderful YA novel The Fault In Our Stars, so in celebration of the movie poster being released back in January I drew the movie poster which features Shailene Woodley and Ansel Elgort who play Hazel Grace Lancaster and Augustus Waters respectively. This drawing is probably the most challenging one I have drawn to date because of all the features I had to contend with. First off there are two people. A drawing with just one person can be difficult at the best of times, add any more and it becomes a real challenge. Second factor is the various materials and textures I had to draw which take up most of the drawing; hair, clothing, and grass, three very difficult textures to draw accurately. Finally, drawing someone upside-down and making it look convincing!! This proved most difficult. Posted in Art and tagged art, drawing, Film, John Green, movie, TFIOS, The Fault In Our Stars. Bookmark the permalink.